Good news to share this lovely Friday, #UntamedStyle Linkup is back! It's been a few weeks since I last posted a #UntamedStyle linkup post and you know what...I really missed you! Reading the blogs and seeing all the style inspirations from each blogger brought me joy. Seriously missed you all and I just couldn't stay away any longer. Hope you all join me once again each Friday to share your fashion, beauty and lifestyle post with me. Now that I am some what back to a normal schedule with work and my blogging, lets talk fall fashion. This season is one of my favorites for fashion, with some many possibilities for stylish outfits. Sadly the weather here in So. California can be a bit crazy at times, one day its 90+ degrees and the next we are down to low 70s (which is cool for California). As much as I want to be cozy in sweaters, scarfs and boots its just not happening quite yet. So for now its light layers for those crisp cool mornings when we get a bit of a chill. By noon time the heat arrives and you need to shed a layer and bare legs are just right for the warm sunshine. Sometimes I find it difficult to dress during this autumn season, when one day it will be scorching hot and summer like and the next I am freezing cold. So what the solution for these types of fall days in California? Light layers you can peel off and still be stylish and comfortable through out the day. This outfit is a great example of how we do fall in So. California. I found this sleeve less shirt at Target recently from their new plus size line Ava and Viv. Immediately I gravitated towards the color, I am totally having a moment with olive (exhibit A here). 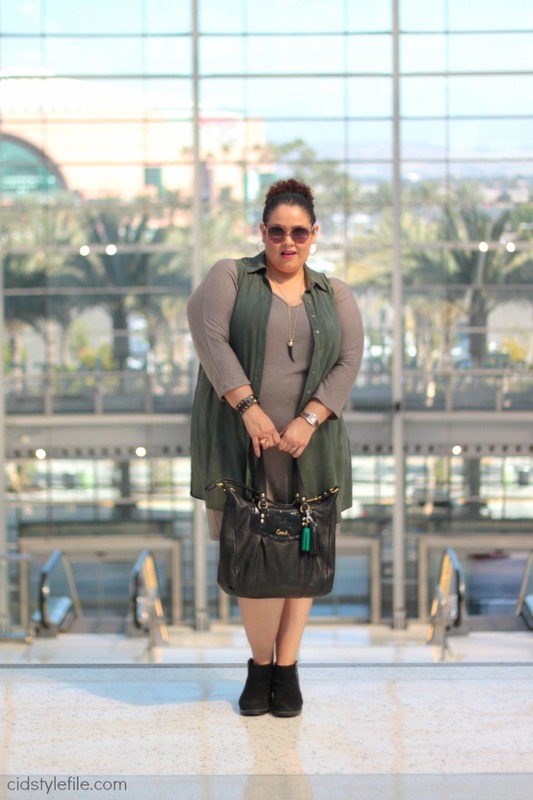 Olive is a great color for fall, the rich shade of green is warm and works as a neutral too. I normally don't wear sleeveless shirt, but this one I had to add to my closet. It reminds me of a vest, thought the length and color is great. I initially thought of wearing a black long sleeve shirt underneath, but that seemed too basic. So since I decided to challenge my style choices, I found another option. 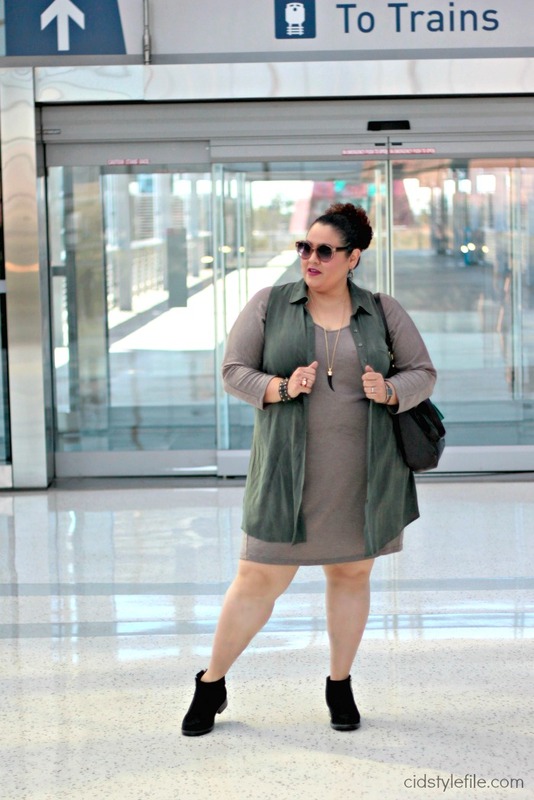 This tan t-shirt dress from Old Navy just seemed to pair so well with the olive. Actually I never even considered these 2 colors together, until I saw them together in the closet. You just never know where you find style inspirations, sometimes they are staring you in the face. So what colors combinations are you loving for fall? Now my dear readers please share those links below, I am sure you have some awesome fall outfits. Next week I will once again feature my 5 fave links. Let's get this linkup party started on again. Thanks for joining me again in this blog adventure and sharing your wonderful post. If you enjoy linking up to #UntamedStyle please follow me on Facebook or Instagram and share this post. I am also looking for bloggers to be a co-host each week, if you're interested shoot me an email: info at veronicacid.com Thanks for linking up! I love how you transitioned this dress to fall, very nice colors. What a fantastic idea to wear this shirt as a vest! I think that's the fun part of styling--being creative!! I feel your pain about living in SoCal and loving sweaters and boots. Your color combo is great and wearing a sleeveless shirt as a vest is a brilliant idea. Welcome back to link ups and thanks for hosting. and thank you for linking with Fine-Whatever. I'm happy that you are back Veronica. The addition of the sleeveless shirt was good idea. And I'm crazy about orange lately. Thank you for linking up with My Red Carpet. I definitely need to get a green vest. You look flawless! This is such a cute outfit! I absolutely love those colors together! Thanks for sharing at the Grace + Lace Linkup! The technologies have cut down time,working simultaneously on different issues and increased efficiency. The platform where communication technology and information technology are merged to suit core needs of banking is known as Core Banking Solutions. There are only two goalkeepers rated higher hanging around: Manuel Neuer as well as David De Gea. Unless you want to invest upwards of 150k, Buffon is your man. I like this outfit so much. Thank you for sharing!